The Online Registration period for this event has expired. 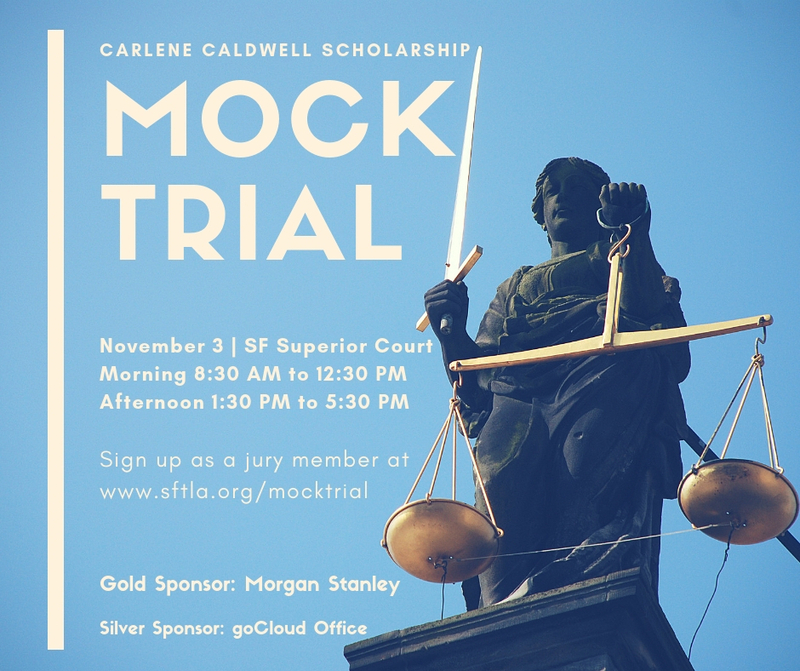 SFTLA Annual MOCK TRIAL- We need you! Every year SFTLA hosts a mock trial for Bay Area law schools. This year the teams will be from Golden Gate University, Hastings, Santa Clara and Stanford. The teams square off in AM and PM sessions at the SF Superior Courthouse- followed by the awards ceremony and cocktail reception. One of the important elements of our competition (beyond the scholarship money each team member receives- all donated by SFTLA Members at our annual Silent Auction) is the feedback the students receive from the "jury". The jury consists of members of SFTLA. Please consider taking some time out of your day and volunteer with us. We promise to feed you well in return! Each trial team will consist of four students: two attorneys and two witnesses. Team members may change roles between sessions. The competition will be judged by the members of SFTLA. They will score according to the criteria provided. High-speed court reporting students or newly licensed court reporters will report the trials and provide rough draft transcripts. Thank you to Ana Fatima Costa for coordinating this. The morning competition will begin at 8:30 a.m. Breakfast food and drink will be served from 7:30 a.m. until the competition commences. Lunch will be served after the morning competition. The afternoon session will begin at 1:30 p.m. Winners will be based on the highest average score across both sessions, eliminating the highest and lowest scores for each team in each session. We will reconvene to announce the winning team and enjoy additional food and drink shortly after the afternoon session has been completed.